The time has come to announce my retirement from the game of hockey. This marks the end of a journey that started as a six-year-old boy in a tiny town in the Czech Republic and carried me through 970 games in the National Hockey League, many playoff games and a Stanley Cup Championship, three Olympics, and four World Championships over my 13-year NHL career. I need to first thank my parents, who encouraged, pushed and humbled me when I needed it. They drove me to thousands of practices and games as a boy, and without them, none of this journey would have ever been possible. I would also like to thank my wife, Andrea, and daughters, Tereza and Victoria, for being there for me through the good times and a bad, and supporting me in every decision I made. I would like to thank all of the players and coaches I have played with and for, from my days as a youth to my Czech national teammates and those from four different NHL teams. You all helped me become the best defenseman I could be and have given me friendships I will treasure forever. The vast majority of my career in the NHL was spent with the Tampa Bay Lightning, including our memorable Stanley Cup Championship in 2004. I wish I could say something about each and every one of my Lightning teammates and coaches, but the list would be too long and I wouldn’t want to leave anybody out. You know who you are and it was honor and a privilege to play with each and every one of you. I do need to give special thanks, however, to the legendary Phil Esposito, who in the 1996 NHL Draft said: "I want that big kid from the Czech Republic, Kubina, I think." Phil, I hope you are still glad you drafted me and thank you for this incredible opportunity. Finally, I would like to thank the great Tampa Bay Lightning fans. Although I did not have the opportunity to play my final game in front of the same fans that I played my first game, which I desperately wanted to do, rest assured my heart, my skates, my No. 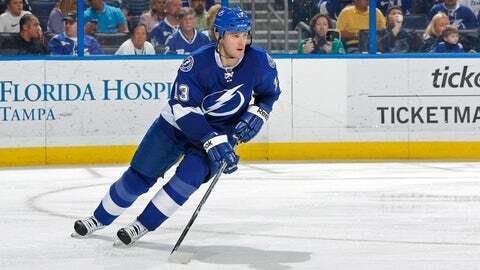 13 jersey and my home will always be here among you in Tampa Bay. Your cheers and your support throughout my career gave me fond memories that I will cherish for a lifetime. Finally, I would like to say Jeff Vinik is one of the best owners I have ever played for and Tampa Bay is very lucky to have him.